When Hurricane Sandy hit New York City, in late October 2012, a lot of us lost power. So I decided to start an Off The Grid category for anyone interested in learning more about household appliances that are either battery, or manually operated. In addition, Off The Grid posts will help you find out where to buy these products, without too much searching. Manually powered appliances give you more exercise. A manual juicer will keep you healthy during a power failure. Your best bet is to stick with manually powered appliances. If you find yourself in a power outage, and have no batteries, your manual juicer, carpet sweeper, or egg beater will always work. 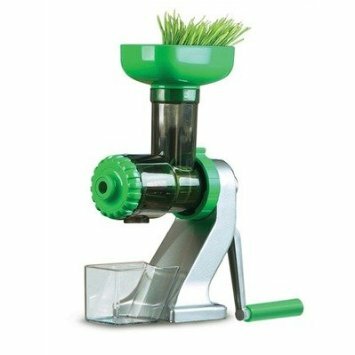 The manual juicer pictured here makes peanut butter, juices wheatgrass, leafy greens, fresh fruits, and veggies. Here’s a handy link to Amazon where the Tribest Z-Star Manual Juicer is sold. Posted on December 1, 2012, in Food, Off The Grid, Recommended Products and tagged hand powered kitchen tools, Hurricane Sandy, living on less electricity, non-electric juicer. Bookmark the permalink. Leave a comment.